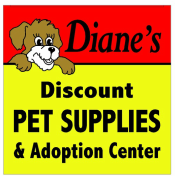 At Diane's, we have lots of birds, small animals, fish, and reptiles that are not part of Diane's Adoption Center or any other rescue organization, but would make great pets. For adoptable dogs, puppies, cats, and kittens, visit Diane's Adoption Center or come visit them in our shop. Lovebirds: MANY just weaned hand-fed babies! Cockatiels: MANY just weaned hand-fed babies! Parakeets: MANY beautiful hand-tamed, home-raised babies!